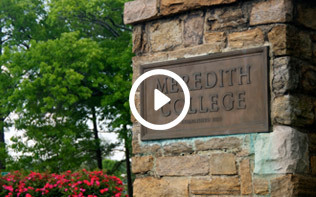 Meredith College welcomes visitors to our campus, located in west Raleigh. Easy access to the campus is provided by Wade Avenue — an Interstate 40 connector — and by US 1/I-440. The Raleigh-Durham International Airport, served by the major airlines, is only eight miles from Meredith. For information about area attractions and lodging near the Meredith campus, please visit triangle.citysearch.com. The directions below guide you to Exit 3, Hillsborough St./Meredith College, on I-440. Turn left off the exit onto Hillsborough Street. At the second traffic light on Hillsborough, turn left into the main entrance to campus. Johnson Hall is straight ahead; there you’ll find signs and an information booth for help in locating other facilities. From Highway 70 West — Exit onto I-440 South (US 1 and 64 West); take I-440 to Exit #3. From Highway 70 East and I-40 East — From 70 East, take I-40 West. Follow I-40/ 440 West to Exit 293. East travelers, take I-40/440 West as well. At Exit 293, take I-440 North to Exit #3. From I-40 West — West of Raleigh, follow the Wade Avenue Exit (#289). At the I-440 junction, take I-440 South; stay in right hand lane and take the next exit (#3). From US 1 South and 64 West — 64 West travelers take US 1 North. US 1 will become I-440 North. Follow it to Exit #3. From US 64 East — At the I-440 junction, take I-440 North. Follow it around the western part of the city to Exit #3. From US 1 North and 401 North — At the I-440 junction, take I-440 West to Exit #3. From US 401 South — Take I-440 South; follow I-440 to Exit 293, which becomes I-440 North. Take I-440 North to Exit #3. Admissions Visits: The Meredith College Office of Admissions, located in Johnson Hall, is open from 8 a.m. to 5 p.m., Monday through Friday. During the academic year, the Office is open on selected Saturdays from 9 a.m. to 1 p.m. To arrange campus tours and meetings with admissions staff, contact the Office of Admissions at 1-800-MEREDITH. See how Meredith students are going strong.